Happy New Year to all. Welcome to all our new and renewing MRA members. MRA was much blessed in 2004 with a significant number of new members. I am proud of the accomplishments of our committee members, all volunteers! This newsletter will recap what we did in 2004 and where we are going in 2005. Membership/Welcome New Members - The efforts of this committee doubled our membership. They started a Midtown Welcome Wagon to new residents and developed a "welcome packet" that included special offers from Midtown merchants. MRA History Book - Nine stories of local folks were written, capturing memories and interesting stories. Three more folks are profiled in this newsletter. When we get to 25, we will publish a booklet. Let us know whom you would like to see in the news, or submit your own history of a memorable person. MRA Traffic - In 1995, a traffic light was recommended for the Midtown Center. Due to the efforts of our Traffic team this was installed in 2004. MRA Midtown Center - We supported the merchants by establishing a home for Shop Midtown on our website. We continue to encourage the formation of a merchant's association and will work with them and the Chamber of Commerce to further these efforts. Public Art - We were funded for a Greg Brown mural, to be installed in early 2005, thanks to our collaboration with the City Public Art Commission. We look forward to the arrival of the arrival of this third Midtown mural. We were on Community TV with 2 programs. "What's Cooking in Midtown" featuring a Red Box Culinary cooking class. A second program discussed how MRA influenced the process and design of flood abatement measures along Matadero creek. Completion of Greer Park - We will work hard to get this last corner of this park developed. The January Parks and Recreation Commission recommended the formation of a task force to study "what is the community need for this corner of the park" and find a way to fund it. Traffic - Our committee will continue to participate with the traffic department as they evaluate Midtown and prepare an analysis for the City Council. We will decide soon on our fourth priority - either Emergency Preparation/Neighborhood Watch, a focus on Midtown Business, more public art or the revitalization of the West Bayshore Strip. "Downtown Brown" Rebounds to Midtown: If you've lived in Palo Alto for more than a week, you've met Greg Brown--no, he's not from the "Welcome Wagon" (and whatever happened to THAT friendly little touch? ); he's the muralist whose whimsical paintings embellish so many walls in the uptown part of downtown. His trompe l'oeil triumphs have caused many a double-take as we come around a corner to catch sight of an alien spacecraft stuck in a bank's wall, a boy fishing for post office windows, or a limping polar bear regrettably discovering that his HMO won't even see him 'til he coughs up that co-pay. Chalk it all up to the madcap mind and dexterous hand of Palo Alto's own version of that Italian guy who spruced up the Sistine ceiling. The bad news: they both suffered with "Artists' Back Syndrome", a painful condition caused by sustained intimacy with ladders and scaffolds. The good news: now, there's Vicodin. The BEST news: Greg Brown is returning to his boyhood 'hood to paint another of his whiz-bang wonder-walls. When he was growing up, Greg's family lived in Midtown. He went to Jordan junior high (with some regularity) but when that 3 o'clock bell rang, he made a beeline down Middlefield to what he scampishly refers to as his "REAL education," the details of which one can only speculate on with some trepidation. But, the kid turned out all right! And now, through a fortunate set of circumstances, and the support of both the Midtown community and the Public Art Commission, he's going to finally be able to do a piece in the heartland of his youth. Where? Remember Bergman's? When? As soon as the rain agrees to a cease-fire (well, what's a mixed-meta for anyway? ), and the wall can be prepared, most likely in March. What's it going to look like? Greg says he passes by to check the site 3 or 4 times a week, and he's trying to let the wall "tell me what to do". He knows it will be somehow related to his previous work, but the special relationship and those youthful memories that tie him to Midtown are bound to play a significant role in the final imagery. Whatever the ultimate resolution, we can expect an engaging, perhaps slightly wacky visual reminder that life in Palo Alto is full of surprises, among the most pleasant being the vision and virtuosity of Greg Brown. Walkable neighborhoods: There's been a renewed interest in the topic of city's goal of walkable neighborhoods with the recent discussion on our library system structure. How committed should we be to walkable neighborhoods and what does it mean exactly? Walkable neighborhoods and citywide traffic calming has always been top goals of mine as an elected official. Today, they are even more important than ever for many reasons including building strong community networks, reducing the need to drive for services, saving money and encouraging a healthier lifestyle. After some years of debate, there is now a strong consensus on the city council to develop one full-service library and also a distributed system, building on the much-beloved neighborhood libraries. Of course, not all neighborhoods have libraries, but most have some hub: a school, grocery story, swimming pool, park or other facilities. People have suggested book drop-off and pick up kiosks and other creative ideas to extend our network to other neighborhoods, hopefully including Midtown. Midtown has a wonderfully revitalized neighborhood retail center with great coffee shops and grocery stores. It is served by a cross-town shuttle for those who cannot or do not wish to drive. There are parks, schools, an ice skating rink nearby. Ideally, there could be a community garden, local recycling drop-off site, or a homework and activity center where kids could congregate after school. The walkable neighborhood is limited by how difficult it is to cross Oregon Expressway or even Middlefield Road. If it would be possible to go under 101, a weekend or early morning walk to our beautiful Baylands would be opened up. It is a precious and increasingly rare luxury in today's society to have our children walk and bike to school. But with the support of our community and city-school cooperation, Palo Alto has reversed the long term trend and there are more kids walking or biking to school. In short, our commitment to walkable neighborhoods and citywide traffic calming is key to our quality of life here in Palo Alto. Midtown is part of our success story and it will continue to get even better. Congratulations on having one of the most active and successful neighborhood associations! Since June of 2004, the MRA Traffic Committee has been working with the Transportation Division both to determine the effects of the traffic signal at Bryson and to study the feasibility of a four-to-three lane conversion of Middlefield Road between Colorado and Moreno. Topics of discussion included pedestrian and bicycle safety, speed reduction, coordination of signals, and the impact on traffic on streets in proximity to Middlefield. As part of the approval of the light at Bryson, the City Council tasked the Transportation Division with studying lane reduction on Middlefield Road to determine if increased safety for bicyclists, pedestrians and vehicles would occur, as well as the effects on neighborhood streets. On Tuesday, December 14, from 4-6PM the Transportation Division conducted its lane reduction trial on Middlefield in front of the Midtown Shopping Center. Observers included Joe Kott and David Stillman of the Transportation Division, several members of the MRA Traffic Committee, additional concerned neighbors, and, of course, the press. Despite what you may have read, the trial was not an abject failure, and perceptions of the impact varied. Until the results of comparison data (typical weekday rush hour traffic) are in, factual conclusions cannot be drawn. The MRA Traffic Committee and Traffic Division will meet in February to review the data collected during the trial, both actual timed comparisons and observations of the committee members on site during the trial. Based on the results, recommendations will be developed and presented to the neighborhood, the Planning and Transportation Commission, and the City Council. Many people turn left into the shopping center in front of oncoming traffic. Perhaps people are assuming a green left arrow gives them the right-of-way (despite signs posted to the contrary) or perhaps they're just in a hurry and don't mind forcing oncoming cars to have to suddenly brake. The entrance and exit lanes by Longs are striped to indicate the possible presence of pedestrians and bicyclists. Be sure to look out for them when turning onto Middlefield. This sidewalk also has walk/wait signs that both pedestrians and bicyclists need to obey. Cars exiting the center on a green light have the right-of-way, so do look at the signs. The driveway next to Baskin Robbins is a fire lane; parking is not allowed. It is also a one way lane from the back of the center to the front. And it is not an entrance to the center. Is risking a head-on collision worth the 30 seconds of time you think you're saving? The same is true of turning into the exit only driveways at Longs. Be thoughtful about parking to avoid causing traffic backups on Middlefield. If someone is front of Longs is actually backing out, of course let them do so. However, waiting because you think someone walking to a car might open a space for you causes unnecessary backups. What issues do you care about? Midtown Residents Association is "powered" by our many volunteers. We can get more done, with more people. If you have some free time, join one of our committees - Emergency Preparation/Neighborhood Watch, Events, Finish Greer Park, Flyer Distribution, Ice Cream & Issues Fall Social, Midtown Beautification, Midtown Businesses, Public Art, Steering Committee or Write a Story for our Midtown History Book. The story has been told many times of the origins of the studio built during the heart of the depression in 1932. Flo's husband, Heston Beaudoin's family came to Palo Alto from Utah in 1923. "We drove into Palo Alto at night and came down University Avenue. The streetlights were arches. It was like driving through a tunnel of lights. It was fascinating to see all these lights. It was a beautiful town. We fell in love with it because of the trees." Heston and his father built the dance studio in the heart of what was then all orchards. He and his young wife Mabel taught dance, had puppet shows and plays. They declared "Rhythm is our Business"
Flo a native of Canada, came to California at 16 months old. She has loved dancing since childhood. Flo came to Heston's studio to learn tap dance. She fondly remembers her first visit to the studio waiting for the dance instructor, Heston, who was pumping gas at the family's small country store & gas station at the corner of Cowper and Marion. "Bread was a dime, milk was a nickel a quart, coffee was 39 cents a pound." At that time, Heston had 10 studios including Redwood City, Mountain View, Los Altos, Sunnyvale, Pasa Tiempo. Flo started to teach tots when an instructor quit, and romance developed after Mabel died in childbirth. In 1941 Flo and Heston were married. The community celebrated 70 years of dance in their studio in 1992. 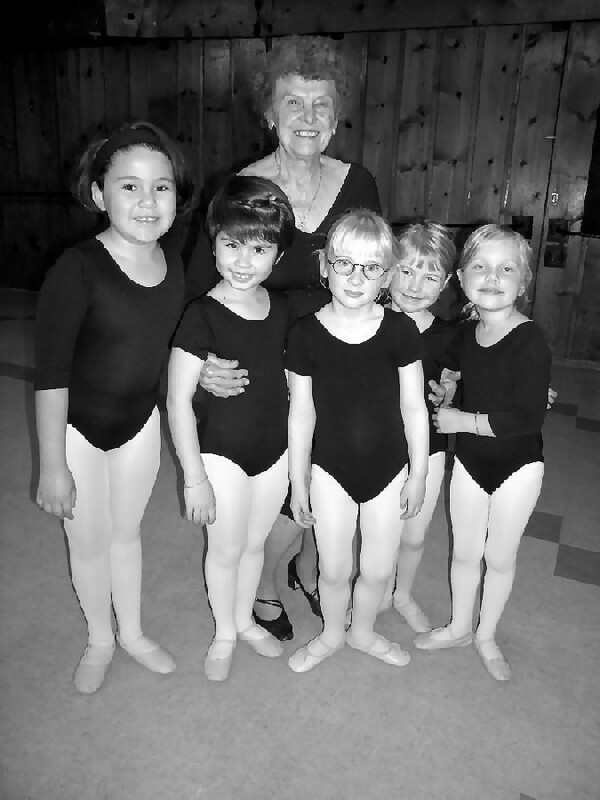 Heston died in 1995, but Flo still does what she loves so well - teaching dance to tots through seniors! Flo reports dance is making a comeback - for fitness, fun, companionship, or balance. There is a trend of couples taking ballroom dance lessons a few weeks before their wedding for that all important first dance. "Men have the most important role in dance; they must listen to the music, work the steps out, lead their partner and make them look good." Flo helps men do just that. Another trend is from women who want to surprise their husbands or friends with a dance lesson. Flo keeps the music current and is constantly on the look out (movies, radio, TV) for a new tune with a good beat. She bemoans the way some little girls dress like Brittany Spears and the lack of manners. A quote from the web site says it all: If we are indifferent to the art of dancing, we have failed to understand not merely the supreme manifestation of physical life, but also the supreme symbol of spiritual life. (Havelock Ellis). 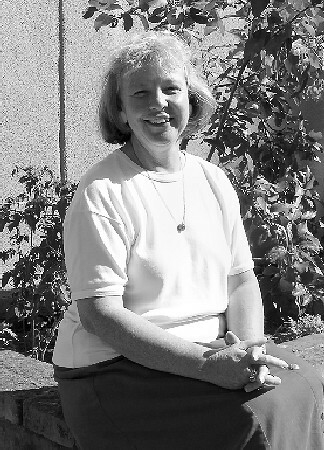 Debbie Mytels founded the Midtown Residents Association in 1994 in response to concerns about the then-deteriorating Midtown shopping area. She organized a meeting at the delicatessen that was in the space now occupied by Mike's Caf�. Out of this first organizing meeting was formed a group willing to work for a more vibrant shopping district, to keep Midtown pedestrian friendly, and to encourage residents' involvement in planning decisions. Debbie is extremely proud of the growth of MRA and our many accomplishments. Debbie has lived in Midtown since 1970. She bought her house while doing graduate studies at Stanford in Communications and Journalism because, believe it or not, the mortgage payment was going to be cheaper than renting! She was attracted to Palo Alto because it seemed like a town with lots of intellectuals, and she liked the looks of the Volkswagen vans bearing political bumper stickers! Debbie remembers that, after adding a second story to her house on Louis Road, she was told by a realtor that she would never "get her money out of it". He went on to say that, in fact, this addition would decrease her property value because two-story houses were never going to be found in Midtown! Debbie has always been interested in giving back to the community. She was part of a babysitting coop in the 70's, volunteered for the PTA, and ultimately was president of the PTA Council in 1979-80. She served on the Co-op Center Council Board in 1978, because she believed in the concept of a cooperative grocery store. She also served as a Girl Scout Leader. Her environmental work is well known. Her first job in the field was a volunteer one at the Peninsula Conservation Center. She worked there from 1988 until 1994, ultimately as the Director of the PCC. She has been a coordinator of the San Francisquito Creek Watershed Project; Executive Director of Canopy, an advocacy group for Palo Alto community trees; Director of Leadership Midpeninsula, an organization focused on developing effective local leaders; and is currently involved in two jobs: one with the Foundation for Global Community and the other with Acterra, a group that merged two former environmental organizations: Peninsula Conservation Center and Bay Area Action. In 1987 Debbie received a Tall Tree award from the Palo Alto Chamber of Commerce. This award recognizes exceptional civic contributions and service to the community by individuals. Debbie has seen lots of changes to Midtown. DeAnza School, where Debbie's children were students, is gone. She remembers buying Popsicles for her children at Piers Dairy when we had a local dairy where you could buy bottled milk and, yes, Popsicles. Greer Park was a drive-in theatre. Bergmann's department store was a great place to shop for sewing supplies and kids clothes. There was a laundry where Mike's Caf� is now, and the Score learning center was once Eddie's, a soda fountain. 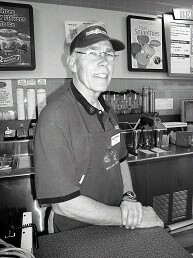 Photo by Sharon Fox It is 10:30 in the morning and 49 degrees outside, but inside Baskin Robbins, Chuck Osborne is putting ice cream in the glass fronted coolers for the afternoon rush. Since 1998, Chuck has continued the traditions begun in 1952 when Ken Napolitano first opened the Midtown store and carried on next in 1967 by Wilson Nichols (who owned the video store next door until his recent passing) then Chuck. Most kids who grow up in Midtown remember fondly the Birthday Club which got you a free ice cream cone on your birthday. You could bring your dog along for that cone and the dog, too, might get his own small bowl of ice cream. After soccer, softball, basketball, to celebrate a victory or console for a defeat, neighborhood teams have always trekked there and lined up for their just desserts. These days though you register for the Birthday Club online. And then there is that new tradition of $1 scoops on Tuesday evenings, starting at 6 PM. spend more time at his local YMCA in San Carlos/Belmont. He will have more time for his three times a week EACH of swimming, bicycling and running. Past President of the Mt. View Rotary, he will continue his decades long service with the club as its secretary. Now, after more than a decade of scooping, Chuck is retiring at the end of January to travel and practice his avocation, the triathlon, as well as spend more time at his local YMCA in San Carlos/Belmont. He will have more time for his three times a week EACH of swimming, bicycling and running. Past President of the Mt. View Rotary, he will continue his decades long service with the club as its secretary. So how does a boy grow up to have his own ice cream store? After spending many years at the "Y" as kid, he went to George Williams College in Chicago for four years and studied group work at the college named after the 1816 London YMCA founder. A native of Orange County, one of Chuck's earliest jobs was at the carnation place at Disneyland and then, naturally, when he moved up to the Bay Area as a director of a local YMCA. He also put in a stint at Mervyn's, but knew that he would eventually have his own small business, like his father and sister. An ice cream store is "a happy place" and he seized the opportunity to buy the Baskin and Robbins on Middlefield Road in Mt. View in 1992. The YMCA group training made him the ideal mentor for boys and girls whose first job was behind the ice cream counter - and for those of us who were on the other side of the counter as well. The Storm Drain system is financed by a monthly fee on utility bills. The current fee, $4.25 a month, was set in 1994 and has never been increased. The ballot measure, chosen by the Blue Ribbon Committee of citizens, proposes an increase to $10 a month to pay for $17 million of specified urgent repairs and improvements. This article explains why you should vote yes. Our current storm drains are in bad need of repair and upgrading: Some locations, such as the Southgate neighborhood, have no storm drains at all. Parts are badly corroded and need replacement and since the City is below creek level, pump stations are needed. As a result, even moderate storms lead to widespread street flooding and driving hazards such as on main thoroughfares like Alma and Embarcadero, and can cause damage to vehicles, garages, basements, and even homes. They also cause up to $100,000 a year in premature pavement deterioration. The proposed repairs are limited to the most critical needs: In 1993, CH2M Hill, a nationally recognized engineering firm, identified a backlog of $55 million in 1993 dollars ($70 million today) in drainage system capacity upgrades. In trimming that figure to $17 million, the citizens' committee selected only the most urgent needs. The Storm Drain Enterprise Fund is the appropriate way to pay for the system: Enterprise funds, such as gas and electric utilities, charge customers for services in proportion to their use or consumption. Storm drains are similar: Fees are based on the amount of rainfall runoff produced, as measured by the square footage of impervious surface on the property; i.e., the greater the impervious surface, the higher the fee. Accordingly, commercial properties with large parking lots pay much more, and while the average residential fee proposed is $10/month, larger lots would pay $14, and smaller lots would pay only $8. What's different about this 2005 measure from the one proposed in 2000? This measure, with its substantially reduced cost, is different in three main ways from the proposal made in 2000: (1) A sunset provision provides that after 12 years, the fee will revert back to the current rate. (2) An Oversight Committee will be appointed to oversee the storm drain projects and the spending and (3) The highest priority projects will be first in line. Fixing storm drains can't wait for flood control on San Francisquito Creek: Storm drains are designed to deal with the runoff that a 10-year storm dumps on city streets. Floods of the level we experienced in 1998 (a 75-year storm) originate from a different cause-overflow from San Francisquito Creek from rains falling upstream from the City. The improvements necessary to avoid flooding from storms of that size are the responsibility of the Army Corps of Engineers and the Santa Clara Valley Water District, and will cost many millions and require years of planning and coordination. In the meantime, there would be street flooding every two to five years unless storm drain improvements are made. And without such improvements, street flooding would continue even after the creek problem is solved. Our drains worked well during the heavy January rains. Nonetheless, the city wants to assess residents $44 million more than they are now paying to raise $17 million over 12 years to reduce temporary street puddles because City Hall refuses to squeeze $17 million over several years from a staff-heavy budget of $115 million as several red flags confirm. First, in 1997 alone Palo Alto admits it spent $552 more per person than comparable cities. City Manager Report 158.98, March 23, 1998 on the city's website. That's $33 million in one year. Second, since 1979 the number of utility employees has exploded from 131 to 340. Many city services have been reclassified as "utilities," which has shifted the costs of street sweeping, traffic lights and street lights, among other, to utility payers. So, when the utility payroll for 200 staff is considered, Palo Alto is paying closer to $48 million more per year than comparable cities. Third, add these 200 new utility employees to the General Fund staff and our true employee ratio is 16 non-utility employees per 1000 residents, while Mountain View and Santa Clara are operating with approximately 8 non-utility workers per 1,000 residents, yet our police and fire departments are not at full strength. Fourth, in December 2004 the S. F. Bay Area consumer price index measured 199.5 (1982-84=100). Our 1979 operating budget of $22 million with inflation should be about $44-50 million. Today it is $115 million. Fifth, Palo Alto continues to enjoy the highest per capita city income in the state, but there is nothing to show for it. Nothing has been built with General Fund dollars in 30 years because it has been spent on staff. Our Council, with the sole exception of LaDoris Cordell, wants residents to bail them out for years of runaway spending on staff by giving them more money to spend. We are entitled to the most efficient government, not the most expensive. We should have facilities in which we can take pride. Mountain View does. Why not Palo Alto? Take the first step in making Palo Alto come to its senses: vote "no" on the street drains. To receive enews updates about events of importance to Midtown, just send your email address, name and phone to MidtownNews@att.net. If your email has changed send your new address to our editor at MidtownNews@ATT.net. Every adult living in Midtown is a member of the Midtown Residents Association (MRA). You benefit from the activities and information that MRA provides. There's enews, the newsletter, the Ice Cream, the general meetings, and co-sponsored meetings (e.g. the emergency preparedness, council candidates). We encourage you to let us know of any developments or issues in Midtown where MRA can play an advocacy role. Please let us know if there are events, awards, recognition or "bit of news" that you would like to publicize If you want to be more involved and have questions, call Annette Ashton 321-1280.